Hiya guys! So I have a bit of a confession... I have a very addictive personality. And somehow this is supposed to be shocking coming from the person with over eight helmers of nail polish. But really guys, it goes into even scarier territory than that. I've actually become an addict to playing the Kim Kardashian mobile game.... And wait... it gets worse because I do find myself buying in game items with real money. I can feel the judgement, haha. Seriously I hate myself for this and it's a habit I am definitely on the path to breaking. But the reason I am even sharing this dirty secret with you is because during the holidays there was a sale where buying from Groupon would give me 'free' in-game currency. So of course what's an addict like me supposed to do but combine multiple addictions! Groupon actually has quite the selection and I was surprised by all the different brands and deals on there. But I made a choice for a brand that I don't have much of and so for today I'm sharing swatches for Max Factor Max Effect Ivory. I think I have maybe one other shade from this brand and I don't think I have ever worn it so... good choice! I've babbled for way too long at this point though, so let's go ahead and get to the polish. I purchased my bottle of Max Factor Max Effect Ivory from Groupon a few months ago. Each mini bottle is sized at 4.5mL and retailed on Groupon for $7.07 and had free shipping. Ivory can be described as a rich bright gold shimmer. 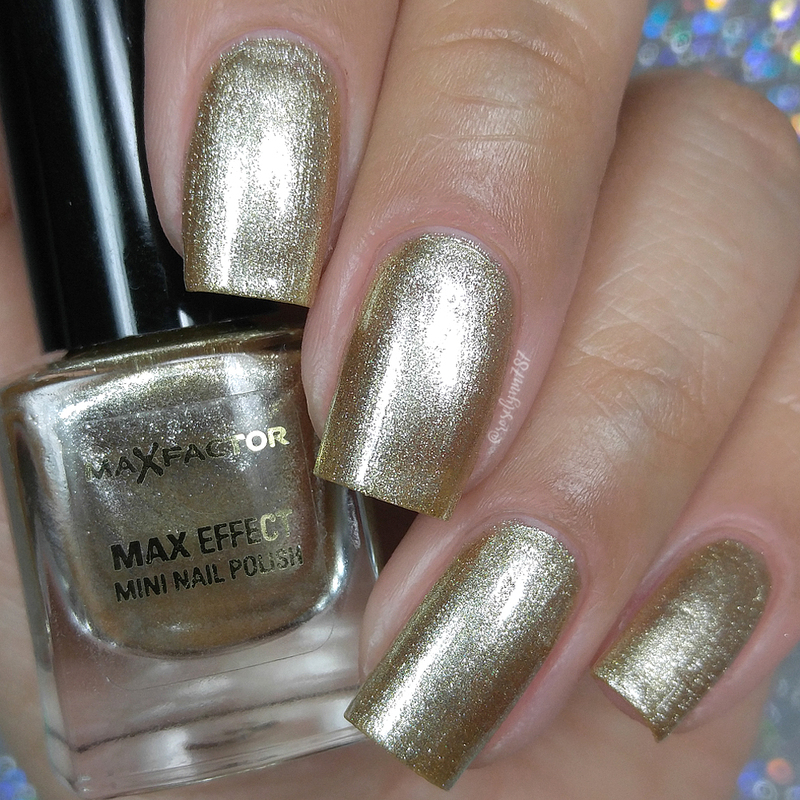 Isn't this such a drop dead gorgeous shade?! Yes, it's simple and straight forward. But that's sometimes all you need in a polish for it to rock your world. It has that very classic regal vibe that just works for everything and anything. Perfect to wear year round, for any occasion whether that be a date or for work. I was actually pleasantly surprised by how much I ended up loving this of color doesn't usually agree with me. In this case I can see that the gold tone does bring out some minor warmth from my skin-tone. 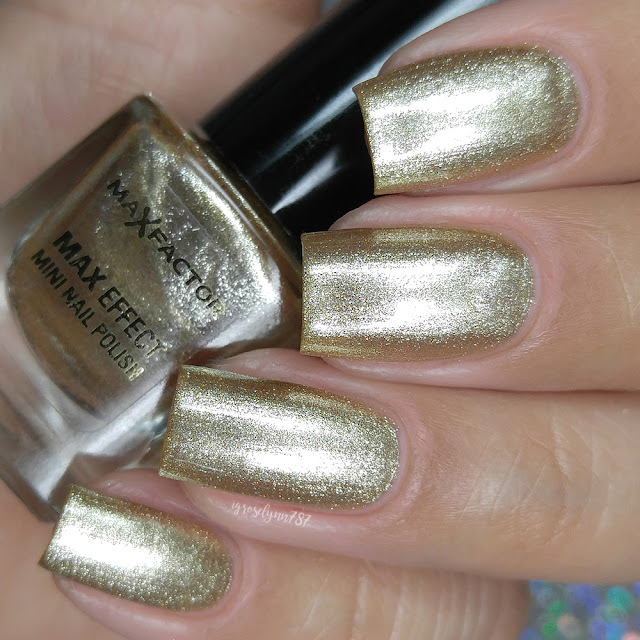 But instead of causing clashing like golds usually do with me this one instead gives me such a beautiful summer glow. 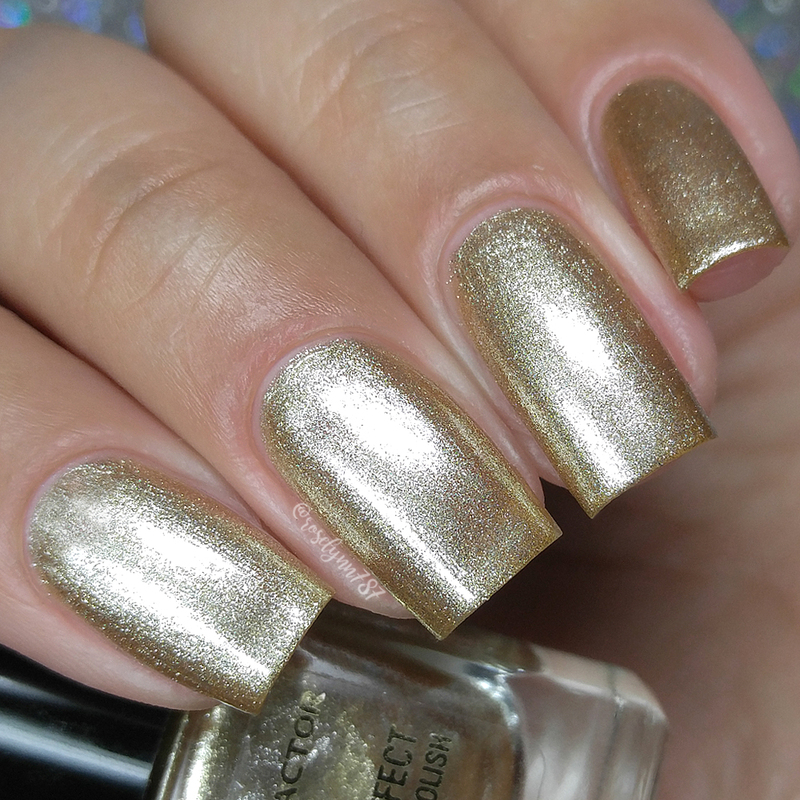 I absolutely love the way it looks against my skin-tone, like by far one of my favorite gold polishes I have ever worn to date. The formula has a very sheer application and I almost feel like it can be used as a topper. It does build-up nice and even though for full coverage. Consistency wise it's well balanced, not too thick or too thin. It dries down to a smooth high-shine finish on its own, but I did add a glossy topcoat as well. There were very minimal brush strokes in the finish during the application that for the most part ended up blending out as it dried. On removal the shimmer dust does tend to 'stick' so after acetone I had to wash my hands quite a few times. That's not something that bothered me too much though, but is worth mentioning all the same. Shown here in three coats and sealed with a glossy topcoat. Overall... do I regret making this purchase? It's a hard toss up to be perfectly honest because I cannot lie I adore how this looks on me. As I mentioned before, this is such a rare occurrence for my skin-tone when it comes to a straight gold base. But then when you consider the size and the price it's hard to justify it especially if it was tagged at a higher price than what I paid. So bottom line? If this gorgeous beauty is on sale for around $5-7 (or even cheaper) it's definitely a must-have to add to your collection. You won't regret it, however, if it's more expensive I feel like you can find something similar in finish for a big bottle at a better price. 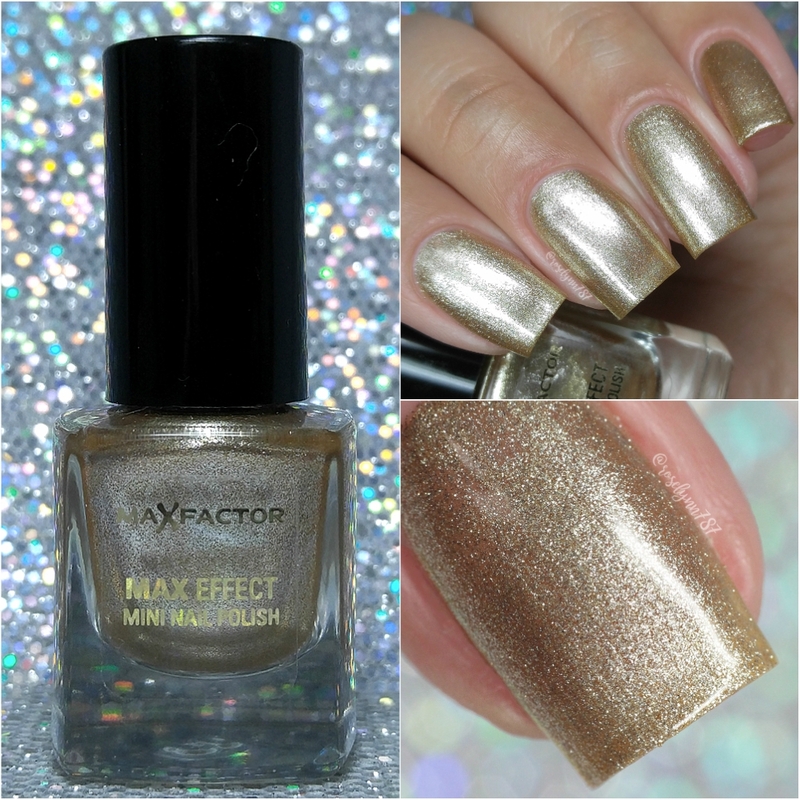 To recap, I purchased my bottle of Max Factor Max Effect Ivory from Groupon a few months ago. Each mini bottle is sized at 4.5mL and retailed on Groupon for $7.07 and had free shipping. The March Holo Hookup is LIVE!